New Jewish Theatre continues their season with the Alfred Uhry comedy, “The Last Night of Ballyhoo.” Set in 1939 Atlanta, it’s a comedy that broaches some very serious subjects that are still around today including the paradox of internal prejudice. These days we here mainly about “black on black” crime but this phenomenon stretches across race, class and ethnicity. 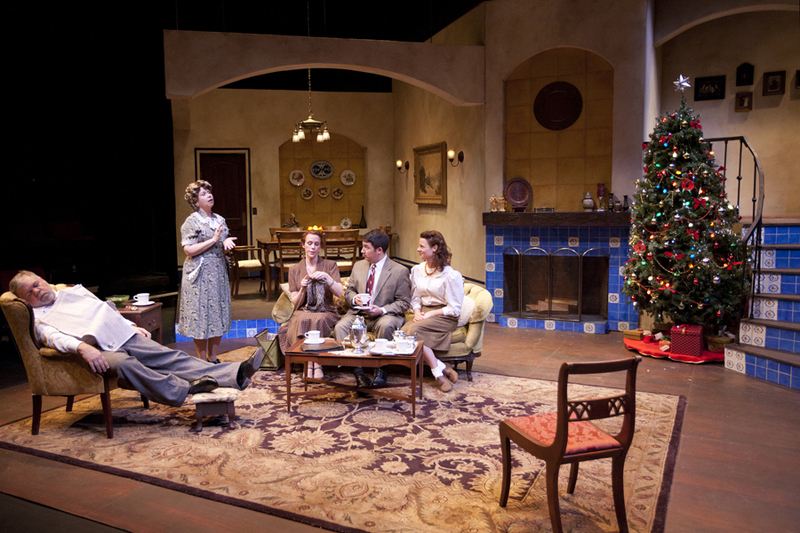 The cast of "The Last Night Of Ballyhoo" at New Jewish Theatre. We’re introduced into a household occupied by brother and sister, Boo Levy and Adolph Freitag. Greg Johnston is admirable as the brother who has taken over the family business- a very successful one- and kept a steady course. Peggy Billo turns in another stunning performance as Boo, who has long resented the “man” in the family handed the job that she thinks she could have handled even better. This, as we find out, is just one in a long line of prejudices (real and imagined) that Boo has boiling inside of her. Not the least of those is her resentment of Jews of ethnicities other than her own. When Adolph brings a hot-shot New Yorker into the local business, she immediately shuns him. He’s a Jew of Russian descent, her family has a German background. With the Second World War approaching, this becomes even more significant to her. In the meantime, other activities are keeping the household busy including Christmas which they celebrate with a decked out tree that Joe, the interloper (according to Boo), refers to as a Channukah bush. Also is the anticipation of the big debutante ball for the Jewish girls in town, Ballyhoo. Boo’s daughter Lala, played to sweet perfection by Rachel Fenton, hopes to snag a date with her childhood friend, Peachy Weil of the wealthy Mississippi Weil’s. Dylan Duke is marvelous as the obnoxious, boisterous Peachy who loves nothing better than stringing everyone along with his crass, childish behavior. Meanwhile, Laurie McConnell is remarkable as the ditzy, lovable Reba Freitag. Her daughter, Sunny, is on her way home from Wellesley where she is an honor student- much to the chagrin of LaLa who couldn’t keep up with her studies at Michigan. Alexandra Woodruff is a charming, demure Sunny who falls for Joe. Adam Moskal plays Joe with proper indignation and winds up softening his stance in favor of love. Catch it all at the New Jewish Theatre through December 18th. Call 314-442-3283 or visit newjewishtheatre.org for tickets or more information. Rachel Fenton, as LaLa, adjusts the star atop the tree in New Jewish Theatre's "The Last Night of Ballyhoo." This entry was posted on December 3, 2011 at 9:43 pm12 and is filed under Uncategorized. You can follow any responses to this entry through the RSS 2.0 feed. You can leave a response, or trackback from your own site.